Many blog owners permit use of OpenID, as comment authentication. In the dashboard Settings - Posts and comments, set "Who can comment?" to "Registered User - includes OpenID". 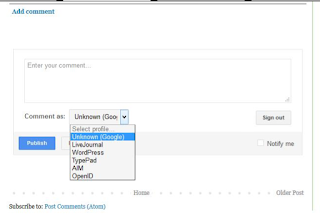 "Registered User" should allow choice of Google or OpenID account, when the comment is being published. But with the "Registered User" option selected, a guest, commenting on a blog, will be authenticated using a Blogger / Google account - if currently logged in to Blogger / Google. In one case reported in Blogger Help Forum: Get Help with an Issue, a Blogger user, with an interfering cookie filter, was logged in to Blogger / Google - but was unable to use either the Google or OpenID account, when commenting. A test comment was published - but it was anonymous. Neither the Google, or OpenID, identity were displayed. The immediate solution was to logout from Blogger / Google - then the OpenID account (which was WordPress hosted) became usable. The general solution, to this problem, appears to be to use two browsers, when commenting. The primary browser, for Blogger / Google authenticated activity. The secondary browser (or possibly an Incognito / Private browser window), for anonymous and OpenID commenting activity. I can't see any obvious benefit to having both Google and OpenID authentication as an alternate choice, in the same browser window - so maybe this is a righteous solution.